It may sound unbelievable, but it really is possible to train your brain to reduce pain sensations! If you are one of the many people living with constant pain, you will know how draining and dispiriting it is, and how much your life may be dominated by it. Not everyone feels comfortable with relying so much on painkillers, and painkilling medication is not always able to keep pain sensations at bay. You may have been told there is no other effective option, and that you will just have to find ways to live with the pain. Such advice kills hope, and being without hope tends to focus us more on what is bothering us. There are many causes of pain sensations, but a real difference can be achieved by mastering some very simple techniques. The good news is that as well as giving us pain receptors to feel pain sensations (because pain is one of our essential survival tools), Nature also gave us natural internal painkillers: Endorphins. Endorphins can disrupt pain signals, using the very same nerve pathways. I explain more about this process and why our ability to reduce pain sensations is very real during a HALF PRICE INITIAL CONSULTATION (1 hour, £30). With input from a GP who wrote a thesis on pain receptors, I can show you why and how we can train the brain to reduce the pain! 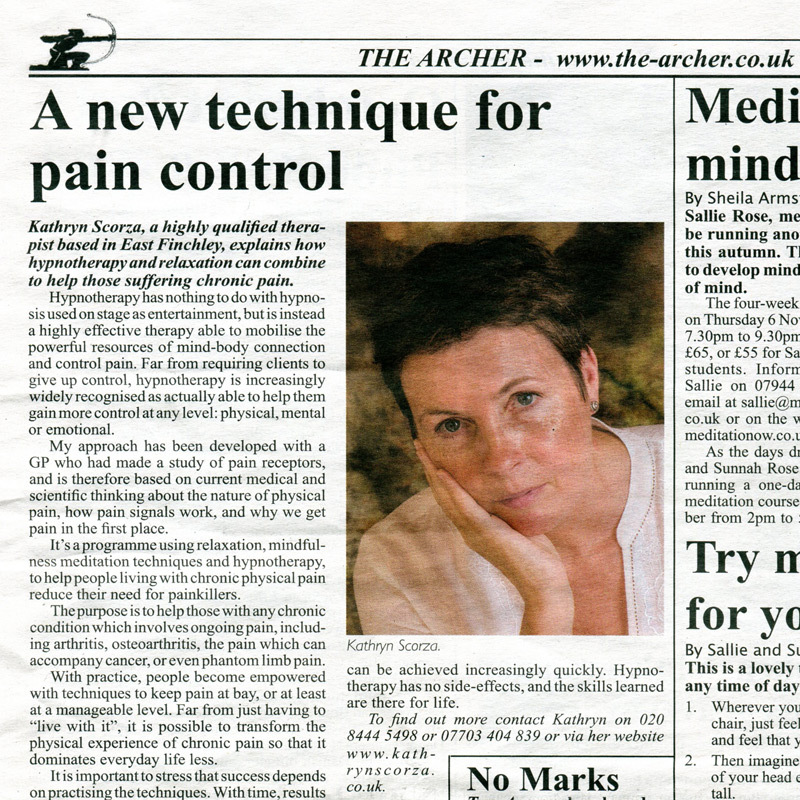 If you would like to reduce your reliance on painkillers, and have been told nothing else can be done to reduce your pain sensations, contact me to find out more about learning the techniques and strategies which can train your brain to reduce the pain. See FAQs on Hypnotherapy for more information.